A couple of weeks ago, at the beginning of the year, Miss Mattie moved up into the Sunbeam class at church. She was very excited to be moving up into Primary with the big kids! I was a little nervous that she wouldn't like Sunbeams, because she LOVED Nursery, and there are no toys or snack time in Sunbeams! She loved it though! She didn't cry at all, and my friend told me that she was wonderful during sharing time and singing time. I'm so glad that she is an independent and social little girl! That Sunday was also Reddin's first time at church. He was one week old, and he did great. He's such a mellow little guy! I was even able to go to Young Women's, while Matt kept him during Priesthood. Hopefully I'll have good luck with him tomorrow, since it will be my first time at church with him, without Matt! 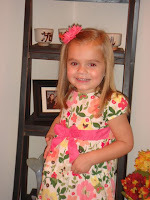 look at mattie in her spring dress! We haven't pulled those out yet. She's a darling little sunbeam, and that sweet Reddin. What a babe. Good luck tomorrow. So glad to hear Sunday went well. You're turning into an old pro! And Mattie is so big. Our first calling after we got married was teaching Sunbeams, I'll bet Mattie's teacher loves her. Hope church went well for ya today. Heather I thought he was related to Reddick Allred. That is pretty cool! Mattie looks so grown up! Can you believe or little girls are already in sunbeams?! I wish Addy was liking it, but she's really missing the toys & snacks! Hopefully she'll get better as she get used to it!